The moment I stepped out of the car, I was transported to a world of pristine grandeur and sophistication that has been associated with the royal heritage of Rajasthan since ages. The display of magnificence and opulence would for a while make you feel royal and a visible feeling of elation that one would necessarily emote on discovery of something pleasurable would fill up the face. 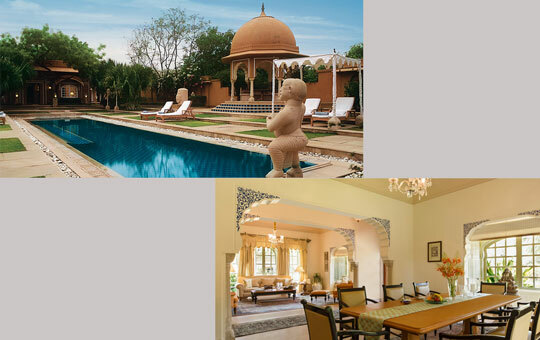 The Oberoi Rajvilas, Jaipur is indeed the place to be if you wished to embark on a journey of royal lifestyle that has once been a part of this princely state. 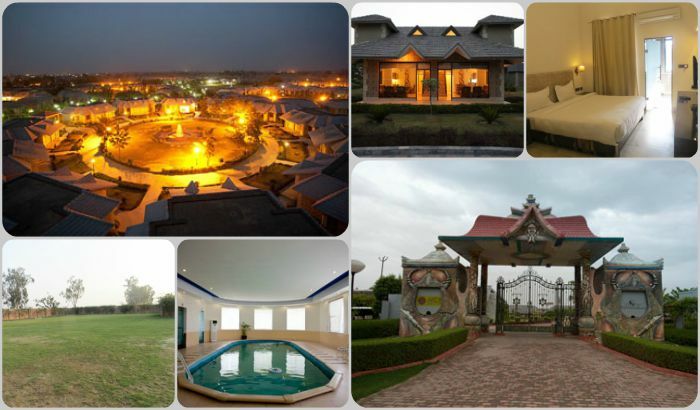 Located just 8 kilometres away from Jaipur, Hotel The Oberoi Rajvilas is a 30 min drive both from the Sanganer Airport and the Jaipur railway station. 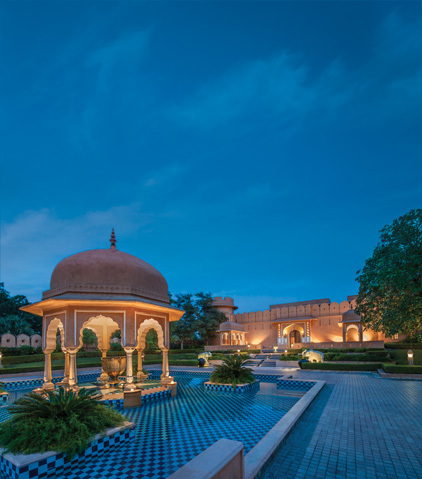 The bygone rich era of Jaipur gets mirrored as you walk through its lush garden, that meets with sophisticated pavilions, cascading fountains and reflection pools at short interval. Rows of the Indian Amla (gooseberry) trees that crown over the pathways merge with the green lawns to present a very pleasing site. The beautiful purple Jakaranda and deep orange and yellow Gulmohar trees are splashed with the contrasting hues of bright flaming red bottlebrush trees. 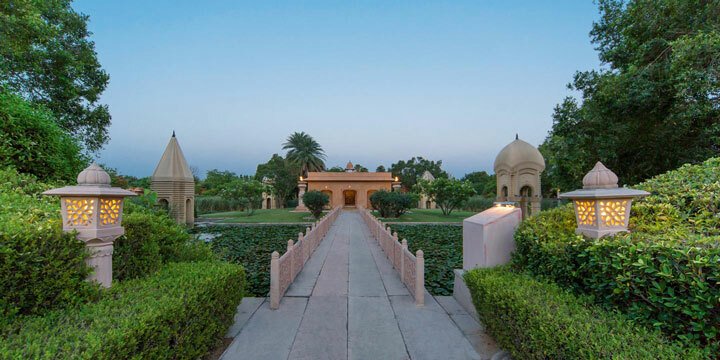 A carefully restored 280-year-old Shiva temple and a Rajasthani haveli (mansion) grace the premises of the hotel that is set in a 32 acres property. Having accorded a grand welcome at the entrance, we were ushered inside the hotel. 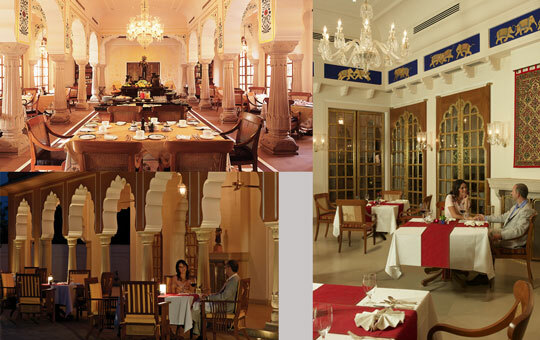 The luxurious interiors, the hospitability of the staff members and an alluring ambience at Hotel The Oberoi Rajvilas were the first things that made me fall in love with this place. We walked through the magnificent hall that has its walls adorned with old armory and fabulous Indian paintings. Ghanshem Nimbark, the master artist had been entrusted with the task of painting the beautiful gold leaf hand painted wall murals and the colourful Indian miniature paintings throughout the fort. 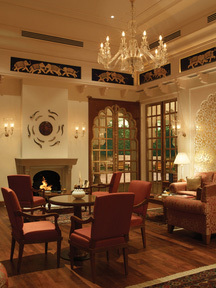 Original paintings by renowned Indian artist, Paresh Maity are also part of the hotel’s Modern art collection. 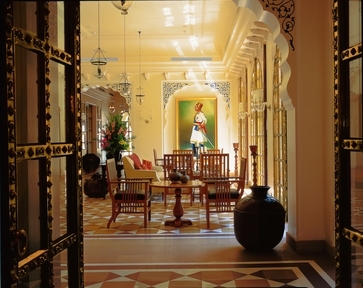 Hotel The Oberoi Rajvilas has a total number of 71 suites and guest rooms. 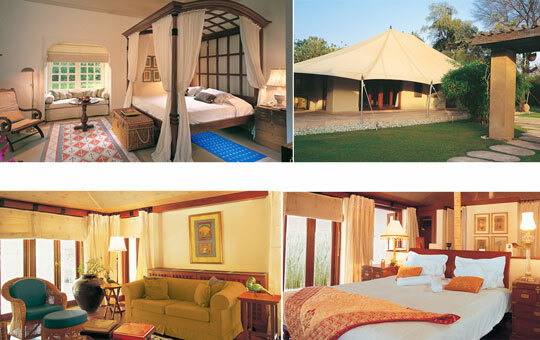 It houses 54 Premier Rooms, 13 Luxury Tents, one Royal Tent, two Luxury Villas and one Kohinoor Villa. The 54 Premier Rooms, measured 42 square meters each are located in clusters of four and six rooms, with each having a central courtyard, a garden and fountain. 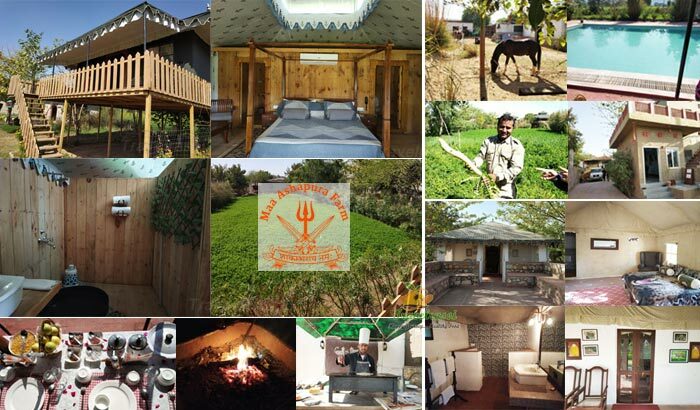 The 13 air-conditioned Luxury Tents that measure 45 square meters each are surrounded by a private garden, a private terrace and a traditional Rajasthani mud wall. The Royal Tent measures 650 square meters and includes a private patio surrounded by a private garden. The air-conditioned tent has spacious interiors with timber flooring. The two single bedroom Luxury Villas, each measuring 355 square meters, include a private swimming pool and overlooks a private walled garden. The Luxury Villas also have a separate living room, a pantry and an outdoor dining pavilion overlooking the pool. 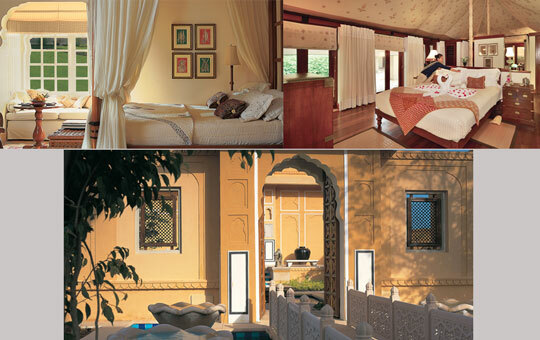 The Kohinoor Villa, the largest of all the room size available has a 60 feet heated pool, an outdoor dining pavilion and elegantly appointed individual accommodations. Elegant furniture, exquisite upholstery and the warm interiors filled with artifacts and coffee-table books create a personal, royal, yet welcoming living space. The Hotel also arranges special Elephant Safari and Sightseeing tours on requests for its guests. If Rajasthani delicacies are a favourite with you, you should try not to miss the dining experience at Surya Mahal and Rajmahal that run alongside the main Hall to the courtyard outside. Surya Mahal specializes in Western, Mediterranean and Asian cuisine, as well as specially prepared Indian dishes and is open all throughout the year, unlike Rajmahal that remains open only from October to March. However, the unusual dishes churned out by the best of chefs at Rajmahal would leave you yearning for more and you can accordingly plan your visit to relish these special dishes during the months it operates. Rajwada is a Library bar that remains open generally in the evenings, from 6 to 11 at night. It is an ideal place to laze around and spend the evening with a friend or two over a drink. The Library Bar boasts of a wide range of international wines, excellent single malts and classic cocktails. The Hotel also offers poolside and private dining (In Room) services. The Poolside dining is another wonderful experience for a romantic dinner. Under the dimly lit mashaals (torches) and with the backdrop of the ancient haveli and the shiva temple, dining by the poolside would for sure leave a lasting impact on the diner. 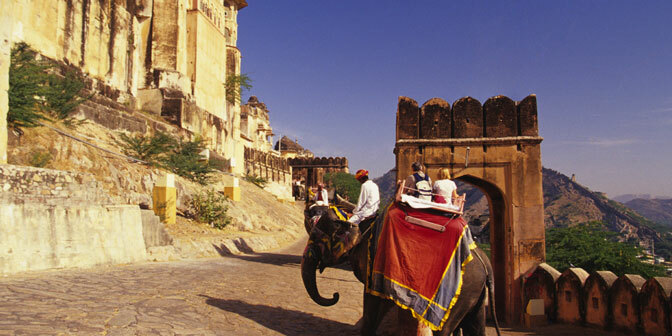 Adding to it are the folkloric sounds of traditional Rajasthani music and dance that reverberate through the columns and the fort walls. While poolside service caters to light meals and snacks, In room services will serve both Indian and Continental food. What could not have been missed while our visit to this majestic hotel was the 280 year old mansion that has been extensively renovated and now houses the Oberoi Spa. It is what you can best describe as the place where you can enjoy complete peace and tranquility by relieving yourself of all the mundane tensions that were once a part of you before you entered this spa. Entering the elegantly furnished spa, the first thing that would catch anyone’s eye would be the beautiful hand block printed linen, the polished wooden floor and the beautiful hand-painted frescoes. The spa facilities include steam rooms, plunge pools and an outdoor Jacuzzi. It also includes four Private therapy suites, four single therapy rooms, a facial room and separate changing areas for men and women. The therapy suites complete with en suite steam rooms, washrooms and large bathtubs are ideally built for couples. With a pleasing ambience and subtly rich interiors, it offers the perfect setting for experiencing holistic treatments by specially trained spa instructors and therapists. Incense sticks and aromatic oil permeate the air with a gentle fragrance, creating the perfect ambience for relaxation and rejuvenation. You can choose your therapy that best suits your senses from an extensive menu of massages and therapies, ranging from non-clinical therapies to beauty treatments, that incorporate ancient Ayurvedic principles, Aromatherapy and Western techniques. The Spa also offers exotic body scrubs, floral baths and rejuvenating beauty treatments, besides including a range of facials and body beautification treatments. Manicures include a relaxing hand massage while the facial includes cranial massage. Foot reflexology helps restoring sore muscles and the hair salon offers deep moisturizing cream baths in addition to regular hair care and grooming. If you are keen to work out while at the hotel, the Spa also houses a fully equipped gymnasium. 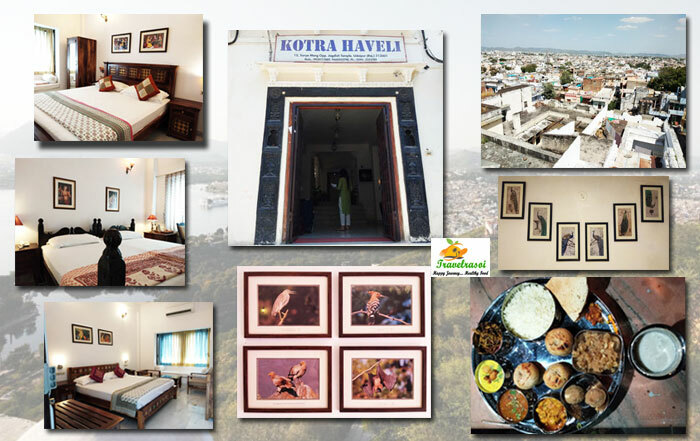 Well, we were here for the purpose of reviewing the hotel but we never had an inkling that we would be left with such an overwhelming experience, so much so that we had already made up our mind to visit this place a second time. 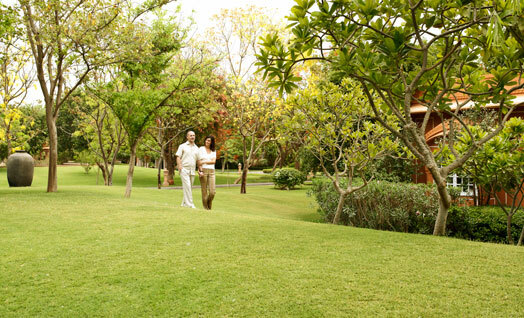 Indeed, we left this place with memories for a lifetime and most importantly the ”The Oberoi Experience” that this hotel promises to give as a parting gift to each of its guests. 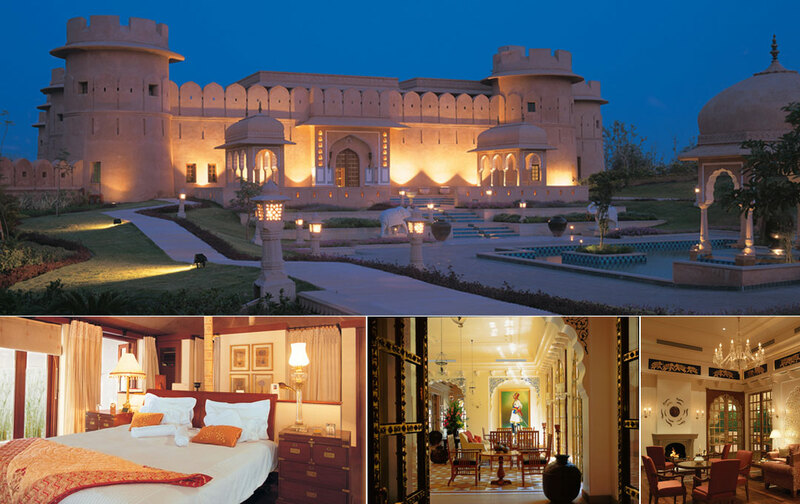 Share the post "Recreate the Magic of Imperial Rajasthan at Hotel The Oberoi Rajvilas, Jaipur"
Hello everyone, it’s my first visit at this site, and piece of writing is truly fruitful in support of me, keep up posting these types of posts.